Early November seems to be the right time for data center product harvest: after last week’s Juniper launch, Arista launched its new switches on Monday. The launch was all we came to expect from Arista: better, faster, more efficient switches … and a dash of PureMarketing™ – the Splines. 7300-series modular switches with 4. 8 or 16 linecards, and having up to 512 40GE ports or 2048 10GE ports – almost twice as many as the 7500E models launched only half a year ago. You can read more about the new hardware in John Herbert’s blog post. Having a very-high-density modular switch, Arista’s marketing got creative – there’s no need for leaf-and-spine architectures if you can connect all the servers to a single pair of giant switches. The idea is not new (and has a few limitations – more about them in an upcoming blog post). We’ve been using similar designs for years as most enterprise data centers these days don’t need more than a rack of high-density servers connected to two 10GE ToR switches anyway. The only difference is the scale – you could connect around 50 servers to two ToR switches (you have to dedicate some ports to inter-server links, storage devices and external connectivity), now you can build a 2-switch network with forty times as many servers. 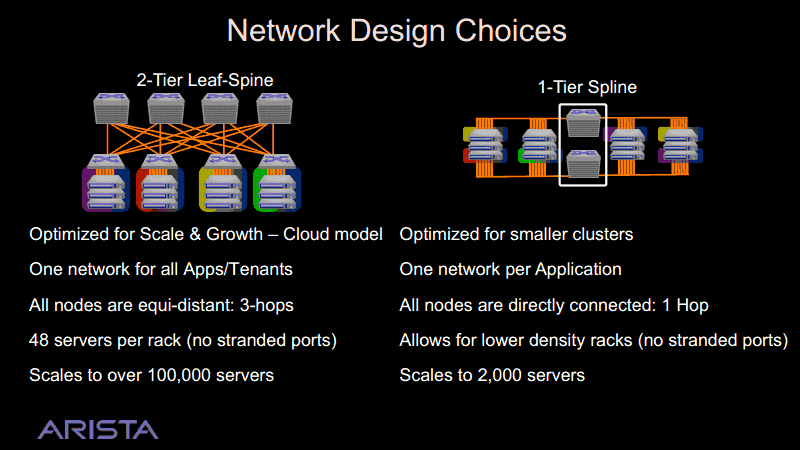 But Wasn’t QFabric a One-Tier Data Center? Definitely – at least from the marketing perspective. QFabric is a single management entity, but it’s still a traditional leaf-and-spine architecture with 1:3 oversubscription and 3 hops across the network (five if you count internal Clos fabric in interconnect nodes). Arista is the first vendor that allows you to build a one-tier (maybe I should write one hop) line-rate network connecting 1000+ servers. We have the concept – one-hop line-rate network. We need a spiffy name. It’s no longer leaf-and-spine, it’s a Spline. Seriously? Which one? Maybe this? 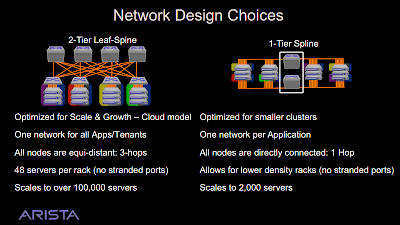 I’ll tell you more about Arista’s new switches in the update session of the Data Center Fabrics webinar, and if you need help designing your brand-new data center network, contact me. I knew I missed something ;) Thank you! Cisco Nexus 9000 just appeared on Cisco's web site. The Nexus 9508 can be equipped with 1152 non blocking 10 GbE ports. You always have a pair of them in your DC, right? Servers and appliances will be connected to both using LACP. Each switch will have redundant power supplies, and possibly redundant supervisors. You get ISSU. In addition, it is not all eggs in one basket. It is just more eggs than before. And I think of it as a big high quality basket. Therefore, I do not see a design failure. When I saw the "spline" architecture I kind of started laughing. Hey that's the same architecture people have been using since switched packet networks came out! I'm sure it will make the guys who love structured cabling happy. I feel sorry for the datacenter tech who is trying to track down the bad rack to rack cable to an end of row rack terminating 2000+ connections. And then Cisco 1-upped them by putting 36x40GE ports on their Trident 2 box instead of the 32x40GE Arista did. 32x40GE is a conscious design choice for Arista - 2 Trident 2s per slot rather than 3 that Insieme used. Arista already has 7500E which can do 36x40GE and 12x100GE. Cisco/Insieme still don't have a 100G switch. It's certainly a design decision to use 12 ports per NPU versus 16 as well. Each NPU has 12MB of buffer so you are gaining some more buffer to spread around by using less ports. The reality is the Cisco card uses .4W/port more than the Arista. The 36x10GE card doesn't have the Insieme chip on it and won't support ACI. Those are meant to be used on the edges of the network not in the core, so if you wanted 100G you could certainly use a 77xx switch in the same role.